Since vinyl’s introduction to the fence industry in the 1980s, it has grown significantly and has established itself as a preferred alternative to traditional fence materials (like wood, aluminum, and chain link). It is a visually appealing product that performs well in virtually any outdoor condition with very little maintenance required. 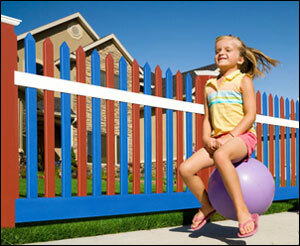 The strength of vinyl fence comes from the additives and modifiers injected during the manufacturing process. These ingredients give vinyl fencing very high marks when it comes to impact resistance, durability, and protection from UV rays. Vinyl fence is also a safe choice for families and pet owners. Unlike wood fencing, which is typically treated with chemicals (to help with durability), vinyl is non-toxic. It doesn’t splinter and doesn’t require sharp nails or fasteners during installation. No fence will last forever, so determining what fence material will give you the most satisfaction, last the longest, cost the least, and require the least amount of maintenance is important. This guide will show you why vinyl should be considered and why it is one of the most popular fence materials in the industry. Vinyl (PVC) fencing has become a popular alternative to traditional wood picket fencing and aluminum. Vinyl possess a variety of unusual properties that set it apart from most traditional fencing solutions. It’s good to examine these properties in detail before determining whether or not vinyl is the right solution for your needs. Here are a few of the most widely accepted advantages of installing a vinyl fence on your property. Vinyl fence requires much less maintenance compared to other fence materials. A vinyl fence will not split, rot, warp or blister like a traditional wood fence. It will also not rust, corrode, chip or peel like an aluminum fence. Vinyl fence can easily be cleaned using basic household cleaning materials like bleach or mildew remover. It is a safer choice for consumers with families and pet owners because it is non-toxic (in its finished state). Wood fencing is often treated with chemicals to safeguard the fence from weathering (pressure treated, southern yellow pine is often treated with chemicals). Vinyl fence will maintain it’s look over time and doesn’t require painting. Vinyl is typically manufactured with the same color throughout the entire depth of the profile so it doesn’t ever need to be refinished. Depending on the level of care you give it, vinyl fencing should last between 20 and 30 years with regular maintenance. Vinyl fence is easy to install. Most of the privacy panels utilize a tongue and groove design that allows for each piece to slide and lock into place. A picket fence install is just as easy with a similar interlocking design. Vinyl fencing is manufactured in a variety of different aesthetic styles. Choose from privacy, semi-privacy, and picket as well as a variety of post-and-rail options. There are also countless ways to customize the look and feel of your fence using different board/picket styles and post caps. Vinyl fencing can manufactured in a variety of colors. The standard for vinyl fence coloring has always been white and tan. There have been a few developments as of late though that has allowed some manufacturers to start creating vinyl in the entire color spectrum. See Illusions Fence. Most vinyl fence companies offer limited lifetime warranties. Warranties will vary from company to company. A limited lifetime warranty covers the fence until the sale of the property or death of the last of the original owners of the property at the time of installation. A transferable limited lifetime warranty is a little better. With the transferable version, the fence warranty can be transferred up to one time to the next home owner if or when you decide to move. A warranty like this makes your fence a true asset and a part of your property. In general vinyl fence is an excellent choice for homeowners and in most cases the advantages will outweigh many of the disadvantages. If you can’t decide, do your research and make sure you are purchasing the right type of fence for your needs. Here are a few of the most glaring disadvantages of vinyl fence. The high initial cost has always been the main disadvantage when installing vinyl. It is typically one of the more expensive fencing solutions available, coming in at around $25 to $40 per foot (compared to wood fence at $15 to $20 per foot). Repairing or replacing parts of your fence can be costly. When vinyl deteriorates it isn’t pretty. It can crack or break. Getting it replaced by a professional, even a small repair, can be expensive since you may need to replace an entire section. Vinyl fence can be sensitive in extreme temperatures (heat or cold), vinyl can bend or crack in certain parts of the country. These are the most popular vinyl fence panel types. The type you choose will ultimately depend on your individual needs. Is your fence for privacy or security? Aesthetics? The fence panel styles below are the most popular in the industry. They typically come in either 6′ or 8′ panels. Vinyl privacy fence is designed to provide privacy to your property from your neighbors or people that happen to be walking by your property. In addition to privacy they also provide a decorative element to your landscape. Vinyl privacy fence is the most popular fence type and one of the lest expensive. They are available in a variety of styles and colors and usually are purchased in panels 8ft W x 6ft H. Most vinyl fence manufacturers offer a number of decorative styled tops to add a touch of style to your fence. These styles can be purchased with added lattice or pickets. Semi-privacy vinyl fence can utilize several designs. Most are created with alternating panels across the back and front (also called board on board or shadowbox) to give the fence the same look on both sides. Another style is similar to a full privacy fence but with 1″ to 2″ gaps in between the boards. They are ideal for neighboring properties (also called good neighbor fencing) since both sides look exactly alike. Since they don’t provide full privacy (slight openings) they allow airflow, while offering some privacy. Semi-privacy fence offers some privacy while still affording for good screening characteristics between neighbors or as a transition from a private space to a public space. Picket fence is one of the most popular fence types. The vinyl picket style was created specifically to replicate the classic painted (white) wooden picket fence. Vinyl picket fencing is made up of posts (in 6ft to 8ft intervals), two horizontal rails, and pickets in varying widths. It is a bit different from privacy fencing in that it is more for aesthetics and defining boundaries. Vinyl picket fence is a functional and classic addition to any yard. Landscapers and home owners love the look and appeal of a clean white vinyl picket fence. Most vinyl picket fencing is offered in 3ft to 5ft heights. Post and rail fencing (or ranch fence) is typically found on farms, ranches, and larger estates. These types of fences are made with either 2, 3 or 4 rails along with the posts. Rail fencing will keep larger pets and animals contained while also allowing for views into the property. Post & Rail is the perfect solution for farm fences, housing developments, and larger businesses. Unlike traditional wood fencing (that may splinter or use sharp nails and fasteners) they are safe for horses, livestock, pets, and children. Most vinyl fence manufacturers offer a variety of accents that can be added to your vinyl privacy and semi-privacy fence to give it a little flair. Lattice, pickets, and rails can be added to the top of your fence to give it a distinct look. Here are a few of the most popular vinyl privacy fence styles and accents. Probably the most popular accent for vinyl privacy fence. This type of accent not only provides privacy but also gives your fence a classic look. The square lattice vinyl privacy fence accents are similar to the diagonal but provide a slight change in style. Another popular choice for homeowners. The framed Victorian top is another popular privacy fence accent. It’s essentially pickets with the tips locked into a rail at the top. Provides max airflow.. Adding pickets to a privacy fence? It’s possible. It provides full privacy while showcasing the classic picket fence design. Choose from a variety of colors. Scalloped picket vinyl fence accents offer yet another way to customize your privacy fence. Manufacturers will even let you mix and match the picket colors. The arched picket design is a great way to set your fence apart from the rest. This design features higher pickets in the middle that gradually lower in height. Stepped picket vinyl privacy fence accents look similar to the scalloped but offers a more dramatic picket height interval. With vinyl picket fencing there are even more options for customizing the look and feel of your fence. Most fence manufacturers offer a variety of picket fencing options. 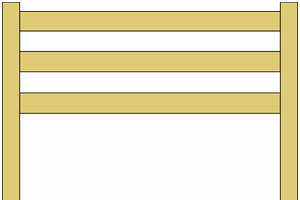 The traditional/contemporary straight vinyl picket fence offers the standard dog ear picket caps. Most are designed with 3″ pickets with 3″ spacing between the pickets. The traditional/contemporary stepped vinyl picket fence is similar to the scalloped version with a more dramatic drop off. It provides a unique look that is sure to be noticed. The traditional/contemporary scalloped vinyl picket fence provides a dramatic appears for homeowners. Pickets decrease towards the middle. The traditional/contemporary arched vinyl picket fence is the complete opposite of the scalloped version. Instead of the rails decreasing towards the middle of the panel, they increase. The straight vinyl picket fence is also offered with reduced spacing in between the pickets. Uses the same 3″ pickets but with spacing of (1.5″ to 1.75″). The straight classic vinyl picket fence is offered with 1.5″ pickets and spacing of 1.875″. The rails are routed to allow for the pickets to pass through the middle. Looks great on either side of the fence line. 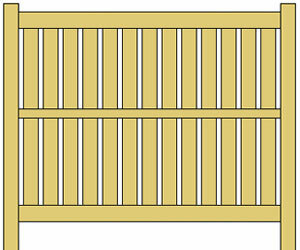 The stepped classic vinyl picket fence is offers a gradual drop in picket height which evens out after the third picket. It also offers 1.5″ pickets and spacing of 1.875″. 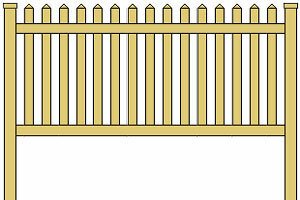 The scalloped classic vinyl picket fence is offered by several manufacturers. The pickets and the spacing may vary but they basic design is always the same. The arched classic vinyl picket fence is designed with a gradual increase in picket height as you move to the center of the panel. Also looks great on either side of the fence line. The framed classic vinyl picket fence is offered without any exposed picket caps allowing for a clean and refined look. The pickets of 1.5″ and spacing of 1.875″ are typically the same. The classic staggered vinyl picket fence is offered with two rails with staggered rails that alternate picket height throughout fence panel. This fence design offers one of the most elegant patterns. The staggered top vinyl picket fence offers one top rail with alternating rails heights. The alternating heights create a classic picket fence look. The framed classic vinyl staggered picket fence is offered two rails with alternating picket heights. One frame, one exposed. The staggered scalloped classic vinyl picket fence is offered with two rails with the lower pickets arranged in a scalloped design. The most common vinyl fence color is, of course, white but just recently some fence manufacturers have started extruding vinyl fence in beige, gray, green, blue, and even black. You can mix and match the colors of your posts, rails, pickets, and more. 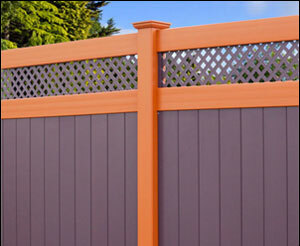 In addition to colors some manufacturers can emulate the look of traditional wood grain fencing with the UV resistant properties of a vinyl fence. Titanium dioxide is a main component in inhibiting UV rays and is one of the more expensive ingredients in the manufacturing of vinyl. So adding color to your fence is possible but it’s going to cost you. Tongue & Groove Boards are the meat of a vinyl privacy fence. The are essentially interlocking panels that create a solid section. The boards measure 4, 5 or 6 ft in height and 3in to 6in in width and fit between the top and bottom horizontal rails. Most tongue and groove vinyl fence panels come in full sections (minus the posts). 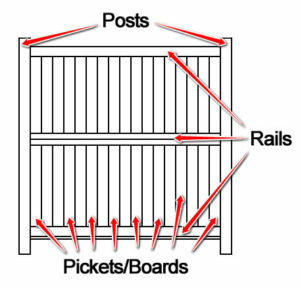 Vinyl Pickets, a vinyl picket fence is made up of vertical pickets that insert into horizontal rails and are secured by a notching method preventing pull out. The tips of the pickets can be interchanged in different shapes and styles. A few picket styles include dog-eared, flat tip, pointed, gothic, and French gothic tipped pickets. Vinyl Rails are the horizontal pieces of a fence. They will tend to be a bit little thicker than the pickets. On a traditional wood fence the rails are placed on the outside/ back of the fence. On a vinyl fence the rails are routed to accept pickets through them so it looks good on both sides. On most professional grade 8ft wide fence panels the bottom rail has an aluminum insert added to prevent sagging. Line posts for straight sections of your fence. Holes are routed on opposite sides of the posts. Corner post can be used at each corner. Holes are routed on two sides of the post, next to each other. End posts can be used for T configurations. Holes routed on one side of the post. 3-Way Posts can be used when your fence is going in more than one direction. Holes are routed on three sides. Blank Posts can be used for gate installation or a free standing post. Vinyl Post Caps come in a variety of styles and are used for decoration and function. Made to fit the top of most standard square posts. Some can even be purchased with lights. Ever hear the addage, “You get what you pay for”? That’s how vinyl fencing products should be described. There are two types of vinyl fencing, consumer and professional grade. Consumer grade vinyl fencing is what you might find at your local “big box” hardware store. It is typically made from recycled plastic and sold in 6ft panels. Since these products are made from cheaper materials you can expect them to fail within ten years. Especially if you install them in harsh conditions (extreme cold or heat). With consumer grade vinyl fence you can expect the components like the horizontal rails and pickets will have significantly less size and thickness. Posts are also likely to be shorter with consumer grade vinyl fencing products. Professional grade vinyl fencing, on the other hand, is manufactured using virgin vinyl mixed with UV inhibitors and impact modifiers. This mixture is extremely efficient at protecting your fence from sun damage and allowing your fence to stand the test of time. So in other words, the higher the vinyl quality, the better it will perform in cold and in heat. Professional grade vinyl fencing also offers interior ribbing on its pickets or other forms of general reinforcement. They include galvanized steel reinforcement channels in their bottom rails to prevent sagging. Their sections are also a full 8ft in length which means less posts during installation. The two most popular ways of manufacturing vinyl fence are mono-extrusion and co-extrusion. The mono-extrusion method utilizes one layer of virgin vinyl while the co-extrusion method uses two. Depending on who you ask one may be better than the other. Here is a detailed description of each manufacturing process. Two layers of vinyl are needed to manufacture a co-extruded vinyl profile. An outer layer containing the ultraviolet inhibitor and an inside layer without the UV protection (lower material cost). As long as there are no recycled materials used, the co-extrusion method will create a very high quality fence at a slightly more affordable price. The mono-extruded fence product is extruded from a single layer of material. This process puts UV inhibitors throughout the product (even on the inside where they’re not needed). This means mono-extruded products ultimately cost more to produce which means you may pay more but some say it makes a better product. Which Manufacturing Process is Better? Co-extrusion or mono-extrusion. The American Society for Testing and Materials (ASTM) has specifications for each product line. The buyer should be aware of which specifications are being used by the manufacturer. Some say Mono-Extrusion is better, some say Co-Extrusion. Co-extrusions vinyl fence requires a higher investment from the manufacturer in expertise, tooling, and equipment. Mono-extrusion has a higher material cost, UV inhibitors and impact modifiers are expensive. So which is better? It depends on who makes it? Are they a reputable company that has been in business for decades? Do they offer a lifetime warranty? The longer a fence company has been around, the better they are at what they do. So, instead of researching the better manufacturing process, do more homework on the fence company selling you the product. The #1 indicator of quality in vinyl fence materials is the quality of the ingredients that go into making it, it’s proven performance, and the company that stands behind it.